It looks like skies are set to clear once again with temperatures plummeting into the weekend leading to likely widespread frost. 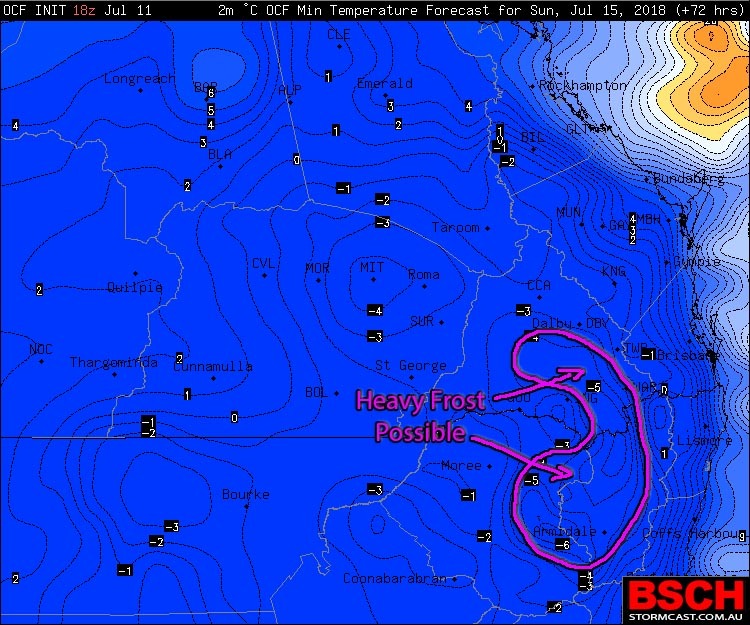 Above image – Minimums for Sunday morning via BSCH / OCF. Over the past few days, particularly in the South East corner of the State, conditions have been rather bleak with patches of cloud, scattered light showers and cooler temperatures. However over the next few days models are indicating that a trough should push towards the Coast and much drier, cooler winds are set to return. A West to South West flow today (Thursday) should clear skies across the majority of both Queensland and Northern NSW. This pattern is likely to remain in place across the next 5 or so days, combining with an upper level trough, to the South, moving up from NSW to produce much colder conditions each night as the pattern takes its toll on the atmosphere. The coldest mornings are expected on both Saturday and Sunday with below average, but slightly warmer warnings on Monday and Tuesday. Stanthorpe has the potential to record 3 straight mornings of -4ºc or colder – something that hasn’t happened in July since 2012 for the town. Inverell and Tenterfield in NSW are looking at 3 straight mornings (Saturday, Sunday, Monday) of -5ºc or colder… Glen Innes -6ºc or colder. These temperatures could lead to heavy frost in places. Widespread minimums below 0ºc are expected across large parts of Southern Inland QLD, pushing into Central parts of the State as well as Northern NSW. Many places across the Darling Downs, Warrego and Maranoa, NW Slopes and Plains are expected to drop to -2 or -3ºc on several mornings. 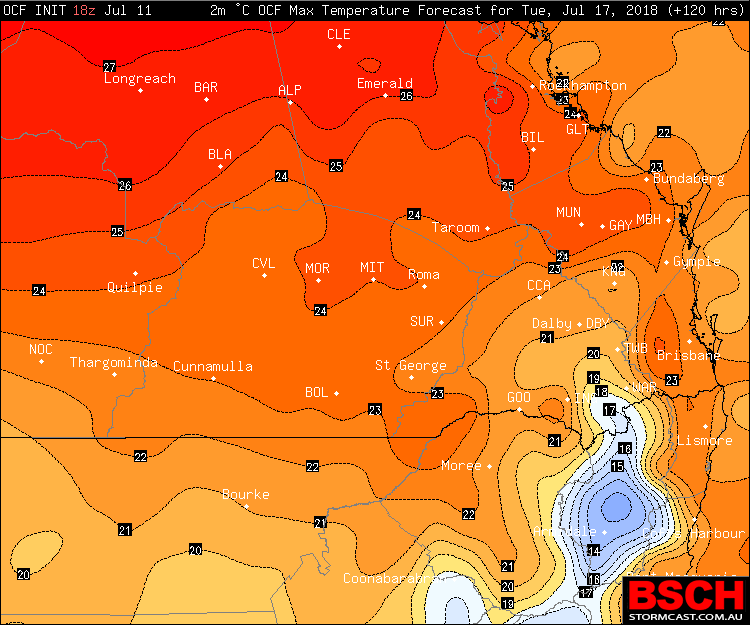 Closer to the Coast, Brisbane might see its coldest morning of the year with 6ºc on Sunday… while places such as Ipswich, Boonah, Beaudesert, Gold Coast Hinterland, Kingaroy, Gatton, Toowoomba, Lismore, Casino are all expected to drop below 2ºc on at least Saturday and Sunday, if not for all 4 mornings. Despite the clear skies leading to cold nights… they should also lead to warmer days. Temperatures should warm up quickly after about mid morning and push into the low to mid 20’s for Coastal areas, which may even be above average for some areas.